Taking serious notice of the alleged custodial death case of Lohian, the Punjab Chief Minister, Captain Amarinder Singh, admitted today that it was a case of gross violation of human rights by the police. Had the policeman in mufti showed fast reflexes, the sensational kidnapping of Prabir Singh, alias Guddu, a student of the local DAV Public School, could have been averted. A migrant labourer picked a 10-year-old girl who was waiting outside her house to go to school in a rickshaw. The girl reunited with her parents in the afternoon after she was recovered from a migrant labourer near the Railway Station. Kislay and Prabhveer may have hogged the national limelight, but the case of playwright Avtar Kaur Jawanda, who has been missing since May 6 last year, apparently does not have anyone interested. 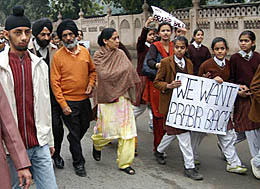 Even the Nabha Police has taken more than eight months to register a case of kidnapping and liquidation in the matter. The case was registered only yesterday. The Prime Minister's Office today set the ball rolling for setting up a Special Economic Zone at Amritsar in Punjab. On behalf of the Prime Minister, Dr Manmohan Singh, who had promised in September last to set up SEZ at Amritsar, his Principal Secretary, Mr T.K.A. Nair, today said that the Union Government would extend all support in this regard. Concessions being given to industries in Himachal Pradesh and Uttranchal are just not enough. For boosting exports, and overall economy of a state, you have to set up Special Economic Zones (SEZs) — at least this is what Lalit B. Singhal has to say. He is the Director-General of the Union Ministry of Commerce and Industry's Export Promotion Council for EOUs and SEZ Units. 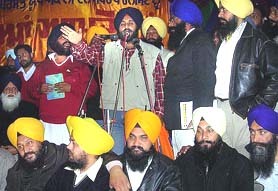 Mr Sukhbir Singh Badal, MP and general secretary of the SAD, here today alleged that Block Development Officers (BDOs) of the area had been working like ‘Congress workers’ and were directing all sarpanches to ensure that votes were cast in the favour of the Congress candidate, Mr Harpartap Singh. It has been an unending nightmare for Surjit Kaur. She still shivers on remembering the horror she underwent on the night of October 31, 1984, when hordes of people, she did not know from where, descended on Gabri, a trans-Yammuna locality in Delhi, killing her two daughters and a nephew. Her husband Sagar Singh was charred to death in the truck he was driving. Amritsar-based goldsmith claims to have made world's smallest scissors. Terming the Governor’s interference in the controversial issue of headship of the Department of Sports and Physiotherapy, Guru Nanak Dev University (GNDU), the Guru Nanak Dev University Teachers Association has lodged a complaint with the president of India, Dr A.P.J. Abdul Kalam, seeking his immediate intervention in the matter. Acting on a tip-off, the Sunam police raided a marriage palace, namely, Bombay Palace, at Sunam, 13 km from here, last night and arrested three women, allegedly involved in immoral trafficking, along with two other persons from the place. Four persons, including owner of the palace and an ASI of the PAP, managed to escape from the scene. The Congress today attacked SAD President and former Chief Minister Mr. Parkash Singh Badal for failing to secure any economic package for the state during his tenures. Though there are many Akali political and religious leaders who have been trying to get all credit for making the Modi Government revive Gurpurb ( Guru Nanak's birth anniversary) holiday, Gujarati Sikhs have a different story to tell. A widow hailing from Kot Ise Khan has alleged that no action has been taken against four policemen involved in excesses against her son despite orders from the ADGP, Punjab. Taking a serious view of violence unleashed in Chattisgarh where shops and other commercial establishments belonging to Sikhs were burnt and looted, the Akal Takht and the SGPC have sent urgent missives to the Prime Minister, the President and the Home minister to take stern cognisance of the attacks. The Jalandhar police today claimed to have solved two cases in the district within eight hours of reporting of the crime. A number of employee unions, including those of the Punjab Roadways, Punjab State Electricity Board, teachers, and Class IV employees, today staged a dharna and blocked traffic on Joginder Singh Chowk in favour of their demands. The blockade disrupted traffic flow on the Ferozepore-Ludhiana road for about an hour. "Nachde Punjabi", the fifth music album of popular Punjabi singer Pammi Bai depicting various hues of Punjabi culture, was released here today. Speaking to mediapersons, Pammi Bai, who was accompanied by Punjabi pop singer Sarbjit Cheema, noted lyricist Inderjit Hasanpuri, music director Kuljit, said Punjabi culture was so rich that singers and performers need not take any support of vulgarity and obscenity in their videos. "It is my effort to make people realise this through my audios and videos," he said. The Lalru Mandi panchayat beat up three persons, including a pimp running flesh trade racket from a house, here today. This was in reaction to the police’s alleged dilly dallying on the issue for the past many years. The encroachments on the busy Rajpura-Patiala highway “flourish” in violation of all norms posing hindrance to the free flow of heavy traffic. The local MLA, Mr Bir Devinder Singh, has requested the Punjab State Human Rights Commission to review its order given in connection with the shamlat land under dispute at Jhanjeri village. About 865 drugs would disappear from all medical stores of the state shortly, due to the strict compliance of the Narcotics Drugs and Psychotropic Substances (NDPS) Act, 1985, said Mr R.D. Gupta, Chairman, Punjab Chemist Association, today. Advocates representing the Lawyers For Human Rights International today claimed that the Ludhiana Police had tortured a man and kept him in illegal confinement for one week. With the reported appointment of Mr Raghbir Singh as SGPC secretary, the SGPC would now have two secretaries. Two persons were found dead in the morning inside a rented room near Azad Theatre, 39 km from here, on the Abohar-Sriganganagar road here. A building coming up in Nihal Bagh, which forms part of the reserved area of the Baradari gardens, has come under the scanner with the All-India State Bank of Patiala Employees Federation claiming that the structure was being constructed even though its building plan had not been passed by the Municipal Corporation. A large number of members of the Punjab and UT Joint Action Committee today blocked traffic for two hours on Nangal Chowk on the National Highway here protesting against the indifferent attitude of the Punjab government toward their demands. Following the protest, the hundreds of vehicles coming from Chandigarh remained stranded on the highway from 12 p.m. till 2 p.m.
Advocate C.M. Munjal, who is facing contempt of court proceedings in the Punjab and Haryana High Court, today resigned from the post of Additional Advocate-General, Punjab. Computers maintaining temperatures and humidity, remote controls to carry out various other tasks, latest fumigation facilities to keep the produce fresh and edible---the state-of-the-art cold storage is all set to start operations at Channo village in Sangrur district by the month-end. Till 4 pm yesterday, thousands of acres of land of this village were under a sheet of yellow flowers of sarson crop, which has started ripening. Today, the entire stretch wore a deserted look as the hailstorm flattened the same within a few minutes. Similarly, the standing wheat crop in Nawapind village of Talwandi Sabo subdivision has come under slush after the hailstorm played havoc with the standing crops. The Punjab Chief Minister, Capt Amarinder Singh, today ordered a special girdwari in the hailstorm-hit districts of Malwa region. The Dharamkot branch of NABARD today launched kisan club and distributed Kisan Credit Cards to farmers. 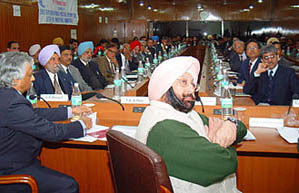 Deputy Commissioner Mandeep Singh presided over the function. The general house of the local municipal corporation (MC) today passed a resolution recommending the suspension of its Assistant Town Planner (ATP) besides disapproving the issuance of a Rs 62 lakh work order by its Commissioner Manvesh Singh Sidhu without taking the Finance and Control Committee into confidence. The CIA staff today seized about 24 quintals of poppy husk and arrested one of the accused in this connection, while the rest are at large. Four car-borne youths with muffled faces tried to kidnap a college student here today. One of the accused has been identified, the police said. The Shahpur Kandi police here has booked an officer of the Indian Foreign Service (IFS) for allegedly torturing his wife for dowry. A case under Sections 498-A and 406, IPC, has been registered against the officer. Forest officers here today booked Shingara Singh, a resident of Bagindi village for allegedly hunting down a wild boar in the village this evening. Shingara Singh, along with six others, was booked by the forest range officer on charges of poaching under various sections of the Wildlife Protection Act. The local police has arrested a car thief Subhash Chander of Nihgahan mohalla, Mehligate, and recovered five cars from him. A 54-year-old resident of Guru Arjun Dev Colony, died on the spot in an head on collision between a scooter and a cycle at the gate of ESI Hospital, here today. The decision of the Punjab Government to revise the scholarships for the wards of the local Sainik School after a gap of 16 years has brought cheer to hundreds of students of the state. Packets of Class V examination papers, supplied by the state government to various centres are without any proper seal or official stamp. A simple cellophane put on the packets can be removed with ease and the papers could be leaked without much effort. A controversy arose over the post of the president of the Beopar Mandal, Barnala, as Mr Chajju Ram, former president of the Truck Union, and SAD (A) leader Anil Bansal claimed themselves the new president of the mandal. Twentyfive industrial and trade organisations of Phagwara today organised a protest march against the Punjab Government’s move to implement VAT in the state from April 1.